President Obama's commencement speeches seem to be his real State of the Union addresses. 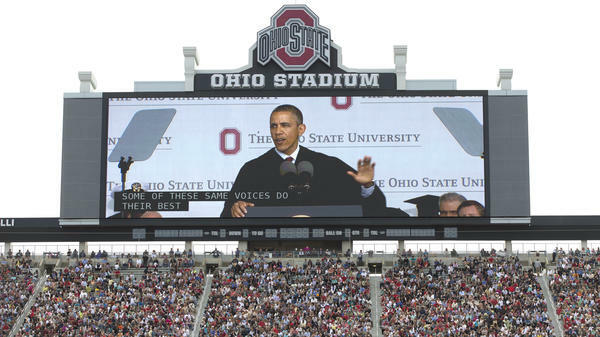 On May 5, he told Ohio State students that they were graduating into a "healing" economy. This weekend, President Obama will give a speech that likely will not be about the current controversies. 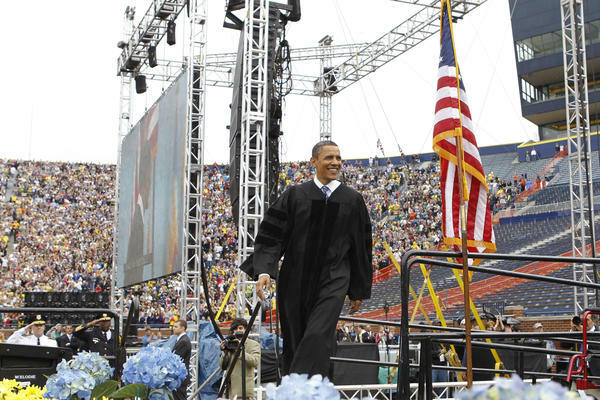 Every year, a few schools get the president of the United States as commencement speaker. This Sunday, he's at Morehouse College in Atlanta. NPR's Ari Shapiro has been reviewing every commencement speech that Obama has given as president, and he's found a few unifying themes. ARI SHAPIRO, BYLINE: These speeches almost seem to be the real State of the Union Address. An official State of the Union is an annual to-do list. But in commencement speeches, President Obama talks about where the country stands and where it's going. That assessment has changed over the last four years. Here's Arizona State, 2009. SHAPIRO: Compare that to Ohio State, 2013.
: You're graduating into an economy and a job market that is steadily healing. SHAPIRO: Here's what he said at the Naval Academy in 2009. SHAPIRO: In contrast, here's the Air Force Academy in 2012. 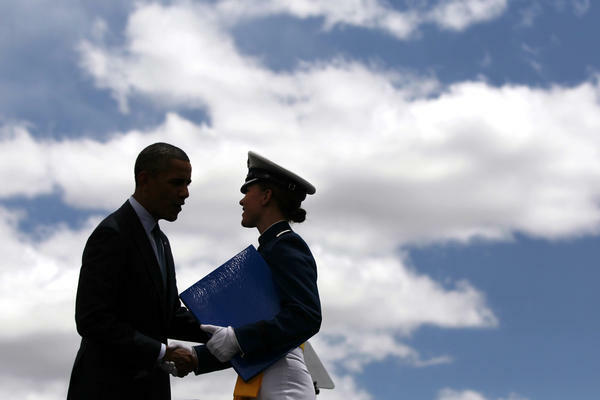 SHAPIRO: Since President Obama took office, he has delivered 14 commencement addresses: four at military schools, two at high schools, one community college, one historically black college, one women's college. Sometimes these speeches road-test lines that come up later in more high-profile venues. Remember this from Obama's second inaugural? SHAPIRO: That line echoed for days, tying together historic fights for women's suffrage, civil rights and gay equality. Turns out, he used the same line eight months earlier in a commencement speech at Barnard College in 2012. SHAPIRO: That speech at women's school focused on gender equality. And when Obama visited a historically black school, the commencement speech focused on African-American struggles. Hampton University, 2010. SHAPIRO: Many of these speeches are tailored for the specific group of graduates in the crowd. At a community college where 90 percent of the students are minorities, Obama talked about immigration. Miami Dade College, 2011. SHAPIRO: While these speeches each have a unique message, there are also universal themes. The idea of unity and community runs through every one of Obama's 14 commencement addresses. Notre Dame, 2009. SHAPIRO: This is the brand of politics that President Obama has always aspired to but that he so rarely attains in Washington. A few times every spring, he gets to leave the capital and tell Americans we're all in this together. He pushes these values of community on a large scale and on a small one. Arizona State, 2009. SHAPIRO: Sometimes in these speeches when Obama talks about society and citizenship, he argues that government is the vehicle to implement those values. That's a core democratic idea that Obama has always promoted. University of Michigan, 2010. SHAPIRO: In a way, this paean to citizenship, shared responsibility and government has become the central idea of the Obama presidency. It was a major part of his campaign as well. SHAPIRO: These ideas are rooted in Obama's work as a community organizer, and today he hopes these ideas will energize people to move lawmakers. 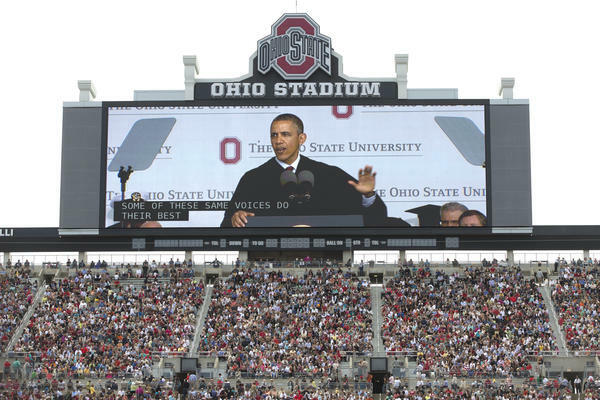 Ohio State, 2013.
: And if they don't represent you the way you want or conduct themselves the way you expect, if they put special interests above your own, you've got to let them know that's not OK.
SHAPIRO: This is a project that President Obama has been pushing since long before he reached the White House. But today, with controversies shining a harsh light on federal bureaucrats from the IRS to the Justice Department, convincing these young Americans to trust their government may be a harder sell than any time in the last four years. Ari Shapiro, NPR News, the White House. Transcript provided by NPR, Copyright NPR.